DAVOS: The US-China trade confrontations, Brexit and other uncertainty are threatening to drag down global growth even further, the International Monetary Fund warned Monday. In an update to its global economic forecasts that was even more pessimistic than those released just three months ago, the IMF emphasised that risks dominate the outlook. The World Economic Outlook cut the global GDP forecast for this year to 3.5 per cent from the 3.7 per cent projected in October. And for 2020 the estimate was trimmed to 3.6 per cent. And due to slowing momentum in latter part of 2018, from trade tensions and rising fears on global financial markets, growth last year was expected to come in at just 3.7 per cent, two-tenths slower than the October forecast. The fund released the report at the annual gathering of economic and financial leaders from around the world and once again urged cooperative action to defuse the risks. 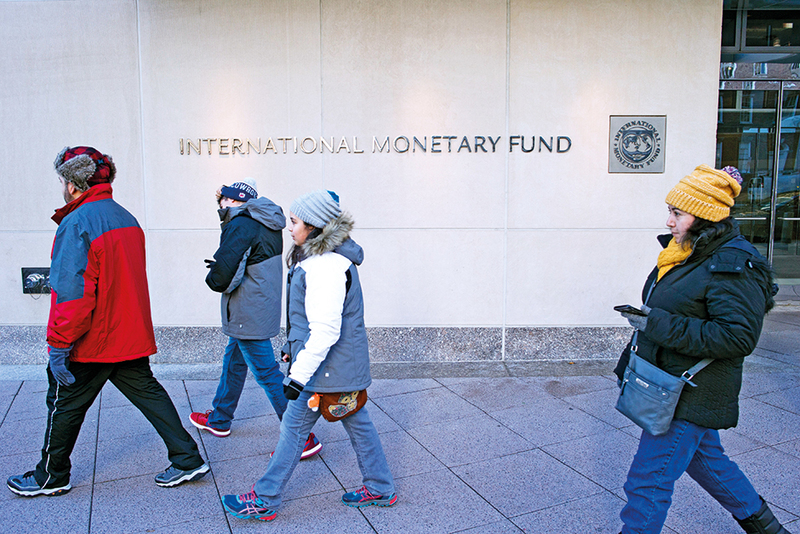 “With momentum past its peak, (and) risks to global growth skewed to the downside... policies urgently need to focus on preventing additional deceleration,” the IMF urged. Several major economies saw sharp downgrades to the GDP estimates, including Germany, Italy and Mexico, along with a smaller cut for France amid the yellow vest demonstrations that have riven the country. However, the world’s two largest economies, currently the source of most of the risk to global growth, did not see further downward revisions. The US is expected to grow 2.5 per cent this year and 1.5 per cent in 2020. China GDP is forecast to expand 6.2 per cent in both years. Since growth is already weakened by the tariffs imposed on hundreds of billions of dollars in annual trade, mostly between the US and China, the global economy is more susceptible to additional risks. An “escalation of trade tensions ... remains a key source of risk to the outlook,” the IMF warned, pointing to the sharp decline in global financial markets in the final weeks of 2018. Another major concern is the potential for a more severe slowdown in China, which would have repercussions throughout Asia. “As seen in 2015-16, concerns about the health of China’s economy can trigger abrupt, wide-reaching sell-offs in financial and commodity markets,” the report said. So far, China’s fiscal stimulus has cushioned the impact of the trade disputes. As in October, the fund urged countries to negotiate a solution that will not inflict economic damage. Beyond the trade risks, other sources of political uncertainty also have the potential to slow growth in major economies, including the month-long US government shutdown, and the possibility of a no-deal Brexit. In the case of Germany, the growth forecast for 2019 was cut 0.6 points to just 1.3 per cent due to the impact on business and private consumption following new auto emissions standards — likely a one-time hit. In France, the impact of massive street protests could trim growth even further than the 1.5 per cent forecast for this year.